TAMPA, Fla. — At some point over the next few days, Sabrina Ionescu is going to have to decide whether she wants to return for her senior season at Oregon or enter the WNBA draft. "It's awesome that I'm able to be in that position and decide what I want to do," she told The Associated Press. "I have a good support system behind me and getting good information on what decision I want to make when the time comes. I'm not thinking about it right now." 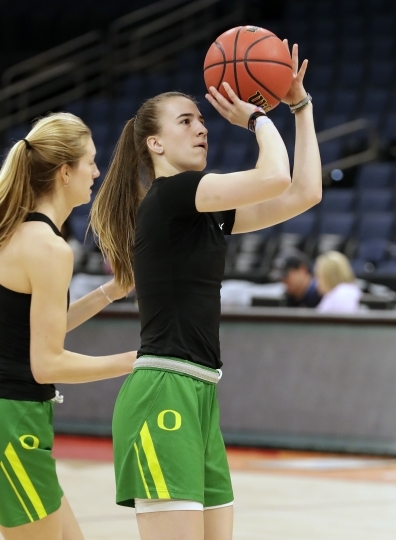 Ionescu, who is eligible to be drafted because she'll turn 22 this year, is well aware that win or lose this weekend, the Ducks have a really strong team coming back next year and will likely be the favorite to win the championship next season. "Oh, yeah. I remember it all. I remember talking, it was just me and the coaches that were here," she said at a press conference Thursday. "I told them we were going to come back here and we were going to come back as a team. It wasn't fun coming alone, seeing the teams you played, seeing the buses get escorted while you're standing on the street watching, because I remember that like it was yesterday. I knew that I wanted my team to experience the little things that I had experienced when I was here, getting my awards. Our coaching staff has been here, they wanted to bring our team. I think we're really happy to be here as a team. Yeah, I remember everything." "She's defined our program since she got here. She's helping us draw record-breaking crowds at home and on the road," Oregon coach Kelly Graves said. "Obviously they love the whole team, but she's the one who made it happen." Ionescu's play hasn't only been noticed by the fans, but also some of the best basketball players in the world. Kobe Bryant came to a Ducks game and talked to the team afterward in the locker room. Steph Curry gave her a shout-out after a Warriors game earlier this week. "She's an unbelievable talent and her team is blazing a new trail for her program. So why not go win it all?" he said . "She's a legend in her own right for sure." The fact Curry would comment wasn't a huge surprise because the two met in February when she drove to Portland, Oregon, to watch Golden State play the Trail Blazers. They spent 20 minutes after the game chatting like they were old friends. "She's a gamer, she's got crazy versatile skills, she just makes her teammates better. Prides herself on winning," he told the AP a week after the meeting. "She's got a great attitude and is a really down to earth person. I appreciated the interaction and conversation. She just likes to hoop. She has a bright future and has done a lot for the game." "It was awesome. He's by far my favorite player right now," she said. "We both lived in Walnut Creek. We knew some people who knew each other. We hadn't had the opportunity to meet each other. It was really chill." At the end of the conversation the two took a photo together on Ionescu's phone. Curry then asked the Ducks' star for a photo on his phone, which he later posted on his Instagram page. "It was almost shocking when he handed his phone over," she said. "I got thousands of followers off that post of his." Her play on the court has made Ionescu a transcendent star of college women's basketball the last few years. Whatever she ends up deciding to do when the Ducks' season is over will have the blessing of her coach. "We really haven't talked about it much and I told her I support whatever choice she ends up making," Graves said.